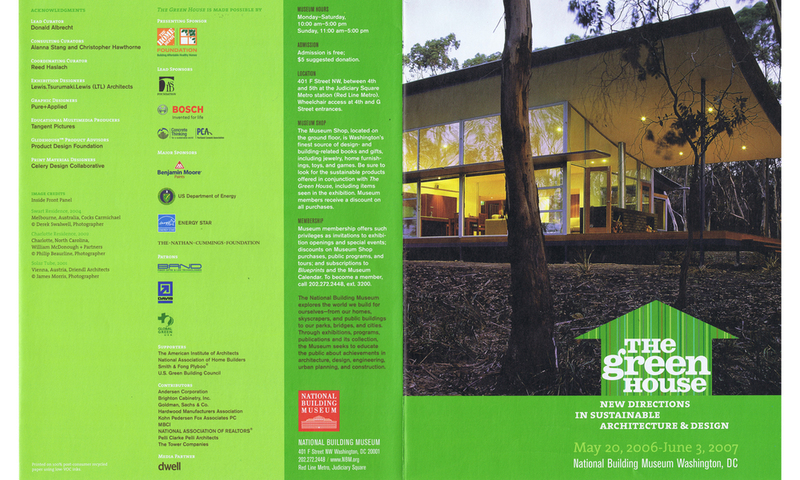 LTL Architects served as exhibition designer for the National Building Museum’s Green House exhibition in the Spring of 2007. America’s building account for 40% of global raw material use. The exhibition served to introduce people of all ages to today’s global warming concerns and the building industry’s response through sustainable products and design. Exhibition Introduction: Have you ever thought about living in a “green” house, one that is healthy for you and your family and helps conserve the Earth’s resources? Whether you are building a new home, renovating an existing one, or looking to make even just few changes in your living habits, every household can incorporate features that support the conservation of the environment and improve our quality of life. As environmental concerns continue to mount worldwide, integrating more sustainable practices and products into our lives becomes increasingly important. There is growing popular interest in green living, and the possibilities for achieving it in our homes are rapidly expanding. Because buildings consume enormous quantities of the Earth’s resources in their construction and daily operation, they represent tremendous opportunities for innovative eco-friendly design as well as cost savings. The Green House demonstrates the emerging collaboration between stylish architecture, interior design, and environmental responsibility. Home is where going green begins—where we as individuals have the power to set a new course for a more sustainable future.